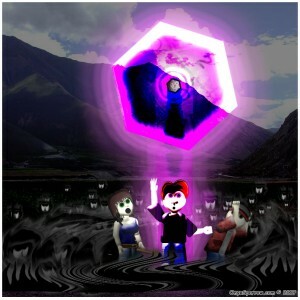 Michael Dellheim, creator of the RPG webcomic Prepare to Die takes the hot seat. 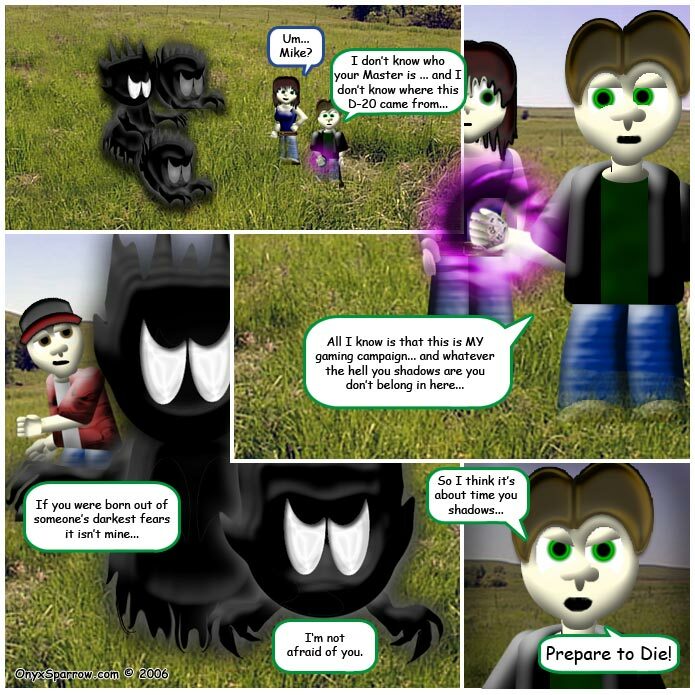 What’s your webcomic Prepare to Die about? In the simplest terms, “Prepare to Die” is a webcomic about three tabletop roleplayers who somehow get sucked into their own gaming campaign. Inside the game we find a world that was created by Mike, the Game Master, for his two friends Bill and Manda to play in… however the world they enter isn’t exactly the way that it should be, and over time the details of the original campaign continue to change. As the plot progresses, the story is also about the NPCs native to the campaign and how they deal with the changing world around them. I think of it a little like ‘Alice in Wonderland’ but with more puns and geek references than true madness. Prepare To Die’s art style appears to be a collage of techniques. How do you create the comic? When developing the style of the comic, I created what I call a “puppet” in PhotoShop, which is essentially a poseable figure made of different body parts created in layers and grouped in folders which are then colored and shaded using Layer Styles. That way, whenever I move or rotate a body part to pose one of my puppets, PhotoShop will automatically create the bevels and shading for the overall figure for me on the fly. When the pose looks right, I then save out a “sprite” and move a copy out into the main strip scene. The addition of edited photographic backgrounds, special effects for light and shadows, and text bubbles complete a comic. To what extent is Mike a self-insert character? Mike is more or less based on me, just as Bill and Manda are based off their counterparts, but over time Mike has developed into his own person. The basic reason he’s in there is not as my own self-insertion as much as having a familiar place to start from. What RPGs do you play? I’ve been a long time D&D player and I’ve dabbled in other systems like V:tm and Warhammer RPG, and I’ve actually developed a few systems of my own over the years with varying degrees of success. I’m also an old school rpg video game player, and a current WoW player on the rpg servers. I am an avid game player of all kinds, from traditional to the newest innovations… basically if it’s a game I’ll play it. That’s hard to say. I’m a natural sponge for random information, and I’m a huge of fan of philosophy and science. I work the story plot of my comic pretty much like it IS an rpg; I know what the bad guys are doing and I know where the story is heading, so every new strip I just ask the characters “okay, what do you do now?” and adjust events according to their answers. I think above all though, the comic is inspired by whatever random puns happen to come along… there’s a lot of bad jokes hidden away in that comic. Do you have a lot of interaction with your fans and does it influence the comic? I do try to have regular contact with my readers… I’m almost always responding things on the shoutbox and if any emails happen to come my way I usually get them returned fairly quickly. I believe strongly in listening to your readers, not just what they say but how they react to things, and keeping an open door policy. If something doesn’t seem to be working, I make some adjustments to compensate… and if someone starts guessing too closely to what’s happening in the story, I throw in a new twist. Like I said before, I create my comic like an actual role-playing game, and a good GM should always be able to adapt on the fly. I also throw in a small reference or two from time to time, using the nicknames of a few of our regular chatters to fill small parts. Beyond that, I used to run some small contests and such once in awhile to play with the audience… which is really something I need to get back into the habit of doing. What it comes down to though, is that I deeply appreciate my readers, the talkative ones and the silent passers-by. I can’t imagine a day that I could ever wall off and just stop interacting with them like I know some comics out there tend to do.